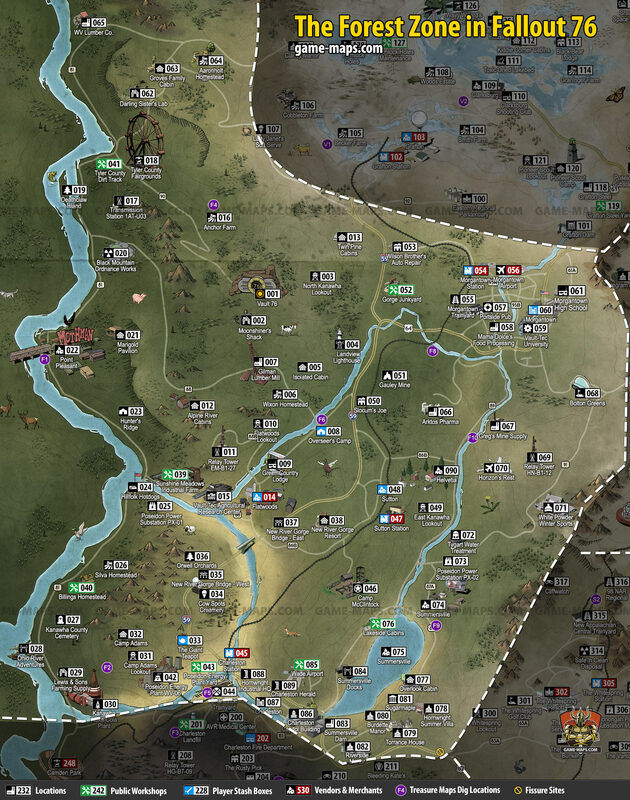 Map of The Forest Region of Appalachia, West Virginia for Fallout 76 Video Game. The map contains all the locations you can visit in F76, Public Workshops, Player Stash Boxes, Vendors, Merchants and Traders locations, Treasure Maps Dig locations and Fissure Sites. A small-town, agricultural-forest area, helps you find the necessary provisions and equipment. The nearest town to Valut 76 is Flatwoods, followed by Morgantown and Charleston. The Forest zone is for players in the level range 1 - 10, monster are level range 1 - 10. This is starting zone, good for low level players. Map of The Forest Region for Fallout 76 Video Game. This is your starting location. Every new character you will create in Fallout 76 will appear here. When checking out more stations, collect items: Purified Water, Rad-X, Stimpack, Radaway, Building Supplies, Pen, Black Rim Glasses. Main QuestM02 First Contact - after you exit Vault 76. When you go outside Vault 76, on the right you will find the Responder's body which should provide you with the first weapon. A bit further there is parkinh where in the car wrecks you will find another equipment. You can fight your first fight with simple bots. Taking stairs to the south you will find Responders Corpse. Machete first, quite good at this level one hand melee weapon. Chemistry Station, Cooking Station, Weapons Workbench. Tower - Tower is guarded by group of quite strong mutants, so beware. If you can defeat them, they have some equipment on them. At the top of tower. Safe The key to the safe is located at the bottom, under the tower, at the roof of the portable toilet. Approach the railing at the top of the tower and Survey Area to get map update. New Locations: Gore Junkyard, Twin Pine Cabins, Gilman Lumber Mill, Landview Lighthouse, Wilson Brother's Auto Repair, Isolated Cabin. Safe Key at the roof of the portable toilet. Small Wooden House near, Water Pump outside. To get inside you have to crawl under the floor and jump up. Safe under the floor, you will need bobby pins to open it. You have to learn this Recipe from Pip-Boy / Items / Notes. HolotapeH61 Holotape: Where Am I? - on picknick table. Safe you will need bobby pins to open it, or use Lighthouse Keeper's Terminal to unlock. Safe outside house, below floor. Three other buildings Tinker's Workbench, Weapons Workbench, Armor Workbench. Player Stash Box this is your extended inventory container. If you hide items into this chest, nobody will take them away. You will be able to take these items from every STASH chest you find in the game world. Event QuestE01 Event: The Messenger to west, west north of Camp. Ensure Mr. Messenger gets to his destination to deliver his message. The Mr. Messenger robot needs someone to replace a nearby component that came loose so it can continue its task. On the way to Lookout there is small house with Armor Workbench. Before that house Ghoul Tent can be present, beware. Bobby Pins - inside house. There are some Weak Feral Ghouls outside tower. I found Forest Treasure Map #01 with them. Come Back To Us - note inside house. Recipe: Scrochbeast Mixed Meat Stew - on platform outside. Survey Area: Relay Tower EM-B1-27, New River Gorge Bridge - East, Slocum's Joe, Alpine River Cabins, Vault-Tec Agricultural Research Center. You can shot defences from range. Destroy Machine Gun Turrets and take what's left of them. There is also some stuff inside. Emergency Management System Relay Terminal you have to fix it, its for later quest. Terminal Relay Tower Brodcast System you will need holotape to use it. All the "special effects" you hear and see in Alpine River Cabins come from a tree house that is located directly to the south on the mountain slope. Ghouls are walking between the buildings. Terminal Agricultural Center Mainframe this is for Event: Fertile Soil, you can make robots friendly in here. You can get on first floor by jumping up. US Government Supply Requisition (random drop) on ghoul, this is a quest starter. Side QuestS08 Request Government Air Drop - start by random drop item US Government Supply Requisition. US Government Supply Requisition holotapes have one-use codes that allow the request of a supply drop from any operational radio relay. But I need to repair the relay tower terminal in order to do that. Tinker's Workbench, some notes, trunk. Lot of stuff around some Ghouls. Tinker's Workbench is in separated building near road. Jangles is a monkey in spacesuit, he is in red booth, on the ground, about center of location. Responders alert warned us that packs of wolves have been spotted in the forest. If we can eliminate the wolf pack leaders, we can draw out the alpha wolf. Event QuestE05 Event: Wolf Horde: The Forest - after Event: Leader of the Pack. Destroy the source of the Wolf horde before The Forest is completely infested. Use Rad-X before you enter river. As the name says, it is an island inhabited by Deathclaws. Black Mountain Ordnance Works is an old, damaged warehouse for storage. The location consists of a main building (by the road), an open space behind it and 8 hidden structures in the field, reminiscent of earth mounds with steel doors. Terminal Terminal it will open Safe (below desk on the floor), and you can check content of 8 warehouses. Short True Laser Pistol in the safe on teh floor. Only Dome 2 and Dome 3 are active. You can check it out in the field, but it really is. Cooking Station is near entrance to Dome 5. Dome 5 is SE of main building. Dome 2 is South East of main building. You will need TNT Dome Key 2 to open it. You will find it later in game. Dome 3 is North East East of main building. You have to pass road. You will need TNT Dome Key 3 to open it. You will find it later in game. The town is controlled by Scorcheds. They are lurking on the roofs. It's best to shoot them from a distance, going to the wheel before you enter the city. Most of the houses are closed on ground level, action grows mainly on the roofs. Near Church (left), there is truck below metal stairs, jump and climb up and open doors. HolotapeH53 The Mothman Cometh - Part 2 Point Pleasant, room on high floor, you have to jump from car to metal stairs. HolotapeH68 Interloper Point Pleasant, room on high floor, you have to jump from car to metal stairs. Climb to the roof and check all upper locations, the move to another roofs. You can find lot of low level weapons on roofs and around. Check other roofs, one entrance is from bridge side, others are from ground level. Power Armor T-45. Power Armor in Point Pleasant in on the roof of house in North part odf the city, near river. To reach thi splace you have to climb top of western bridbe and take plant to roof of this building. This is an abandoned hunters' camp. After the records you can see that they were staying here, not necessarily acting friendly, but one day other even worse and stronger came and everything ended. Note: Hunter's Warning - it shows location of Pleasant Valley Cabins - Raiders Camp. Several buildings and sheds scattered cultivated fields. Some dogs and Scorcheds. Power Armor T-51b in shed. Next Safe is in the house to the south. Chapel and tombs in the cemetery. Safe skill 1 in guard house. Pastor's Vestments on the top of church tower. Small marina, cottage and boat. Quite a large location. Main entrance and flap in the ground to the underground from the west side, loading ramp from the south side. The main building, underground and roof. Terminal Current Product Status - will open safe below on the floor. U-Mine-It! Vending Machine outside, near main entrance. You can buy maps to miners quest here. Side QuestS10 Lucky Strike - starts with Miner's Map bought in U-Mine-It! Vending Machine near main entrance to Kanawha Nuka-Cola Plant. Side QuestS11 - starts with Excavator's Map bought in U-Mine-It! Vending Machine near main entrance to Kanawha Nuka-Cola Plant. Side QuestS12 - starts with Prospector's Map bought in U-Mine-It! Vending Machine near main entrance to Kanawha Nuka-Cola Plant. Small Boy Scouts' camp infested with Super Mutants. Some notes, Cooking Station. I need to find some honey if I want to try out this special tea. Tinker's Workbench, lot of Cream (food). Doors are closed, you need East Bridge Key, it can be found on the bridge (middle) in lunch box. Check pins on Map for new locations. To enter house with close doors, crawl below floor.